The family of rock star Kurt Cobain have said that a rare exhibition of his personal belongings in Ireland shows how "silly, goofy and sweet" the singer was. The display of the late Nirvana frontman's personal collection includes his clothes, sketches, hand-written lyrics and the only car he ever owned during his life, a powder blue 1965 Dodge Dart. 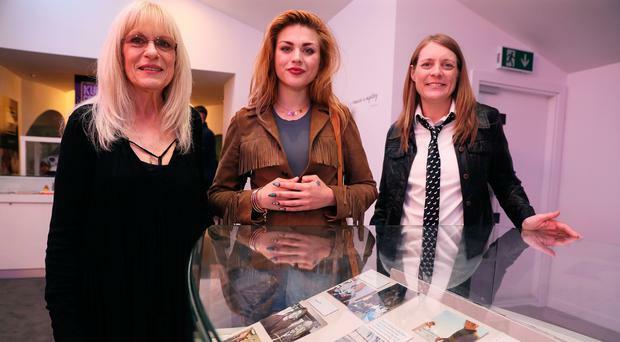 The star's mother Wendy O'Connor, sister Kim Cobain and daughter Frances Bean Cobain attended the opening of the Growing Up Kurt Cobain exhibition in Newbridge, Co Kildare to celebrate his Irish heritage. Cobain's Irish roots are well known, and while the singer believed that his family originated from Co Cork, his Irish ancestors emigrated from Carrickmore in Co Tyrone in 1875. His family curated some of his childhood items for the commemoration in the Museum of Style Icons, running until September 30. His mother Wendy said: "I think it shows who he really was, the real person inside before he got famous." Cobain and Courtney Love's daughter Frances Bean (25) said she thinks of her dad every day. "He's unavoidable in my life, I see a Nirvana shirt every day," she said. "My dynamic with Kurt is probably more similar to a fan's dynamic, as there's almost like an untouchable thing. "All the information I have about him is from stories. He's there every day of my life. "On some days it feels a little frustrating, like I've had emotional breakdowns in Ubers and he's come on the radio and I've been like 'I needed you so much right now'. It plays out on different days in different ways."